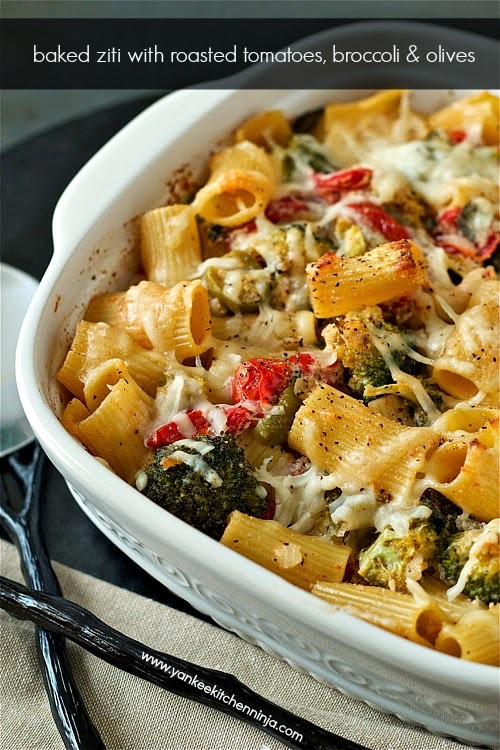 Cheesy baked ziti, loaded with good-for-you veggies -- roasted tomatoes, tender-crisp broccoli and tangy green olives -- makes a hearty meatless meal! I love pasta way too much. If you've browsed my recipe index at all, you'll understand. Not that loving pasta is bad, but all those carbs aren't the best for my quickly-approaching-middle-age waistline. I've been experimenting quite a bit with lower-carb, gluten-free pastas made from things like brown rice and quinoa, and I really do like them. In certain dishes. Like my beet pesto and greens pasta. But there are some hearty pasta dishes for which I have to stick to the real McCoy. This baked ziti, loaded with good-for-you veggies (and no meat! ), is one such dish. While it's familiar name is "baked ziti", I actually recommend rigatoni for this dish. Rigatoni is larger than ziti, which means a larger tube opening to hold the thick veggie sauce -- to which I'm afraid a more delicate brown rice pasta just wouldn't be able to stand up. Additionally, I think the thicker rigatoni lends a heartier element to the whole dish. In place of a traditional pasta sauce for the baked ziti, this recipe gets its all its flavor from juicy tomatoes, roasted to the perfect consistency with fresh herbs and broccoli (yes, you roast them together!) and finished with briny, tangy green olives (although I bet some fat kalamata olives would also be an excellent choice). I seriously love unexpected ingredients like these in traditional dishes! All those veggies paired with creamy ricotta create a delicious, seriously satisfying all-in-one dinner -- no need to come up with any side dishes for this pasta meal. Have I tempted you yet? Are you ready to shake up plain old baked ziti with some healthy roasted veg? Leave a comment: The Ninj wants to know. I make this recipe in either a 9" x 9" or 8" x 10" casserole dish, but it can easily be doubled and baked in a larger casserole to feed a crowd. In a bowl, toss the tomato halves and garlic with 1 tablespoon olive oil, spread out on half of a large rimmed baking sheet and nestle the oregano sprigs in amongst the tomatoes. In the same bowl, toss the broccoli florets with another tablespoon of olive oil and season with salt and pepper, then spread the broccoli out on the other half of the baking sheet. Roast for about 15-20 minutes or until the tomatoes are softened and juicy and the broccoli is crisp-tender. Remove and discard what's left of the oregano sprigs and set the sheet aside, leaving the oven on. Saute the onion in another tablespoon of olive oil in a large skillet for about 5-7 minutes, then fold in the tomatoes, broccoli and olives. Meanwhile, cook pasta according to package directions and drain. Return the pasta the cooking pot and add the tomato mixture, ricotta and 1/4 cup Parmesan, stirring gently to combine. Season to taste with salt and pepper, then transfer the mixture to a prepared baking dish. Sprinkle the remaining Parmesan over the top and bake for 15-20 minutes or until some of the pasta begins to brown on top. ooo, this love perfect for all of the rainy, cold weather we've had lately. 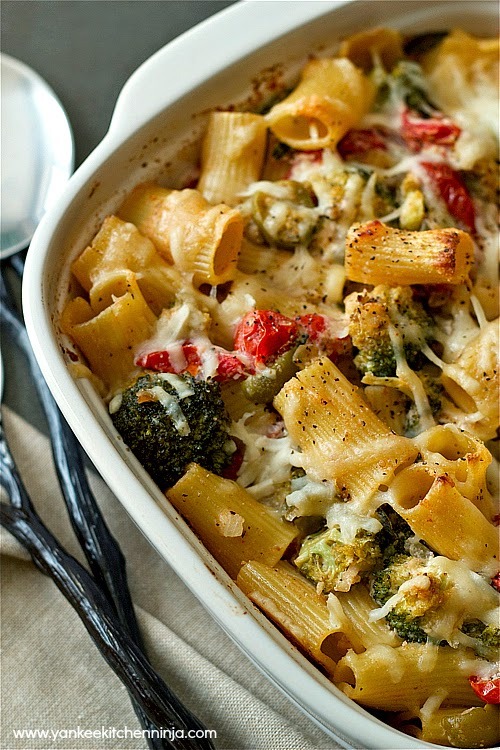 i love baked pasta... and my kids would be thrilled to find the broccoli florets in there! hello, one dish meal. I love that your kids would be thrilled about broccoli! This looks like a great crowd pleaser Julianne. I think the feta idea sounds yummy too.